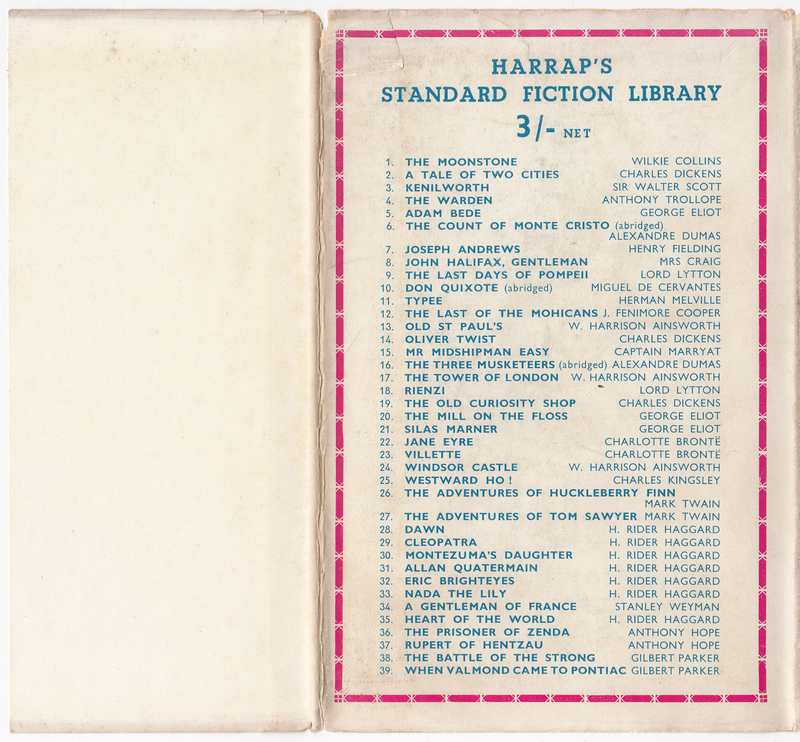 Harrap’s Standard Fiction Library consisted of at least 39 titles, a mix of typical classics with a few popular fiction titles issued from 1925 to 1927 with reprints as late as 1953. It seems like the series gets confounded with a similar series, Harrap’s Popular Fiction Library which was published at the same time. The Standard Fiction Library series was to be published in the US by the Dial Press around 1925 as the Dial Standard Library. The Dial Press was established in 1923 by Lincoln MacVeagh. Between 1925 and 1929, the Press initiated at least seven series. The Dial Standard Library, which was printed from the same plates as Harrap’s Standard Fiction Library was, it seems, never issued. Instead, Dodd Mead acquired the books, already printed and in some cases bound, added their own jackets with the colored jacket illustrations glued on the jacket front, and called the series the Astor Library. The Astor Library consisted of the first 12 titles also in Harrap’s Standard Fiction Library, issued in 1925-1926, along with 2 titles, published in 1927, that were not in Harrap’s UK version of the series. This suggests that the initial 12 title US series was not successful, and a few more popular titles (Dumas’ The Black Tulip and Conan-Doyle’s The White Company) were added in an attempt to drum up sales. That did not happen, and the series disappears soon after. 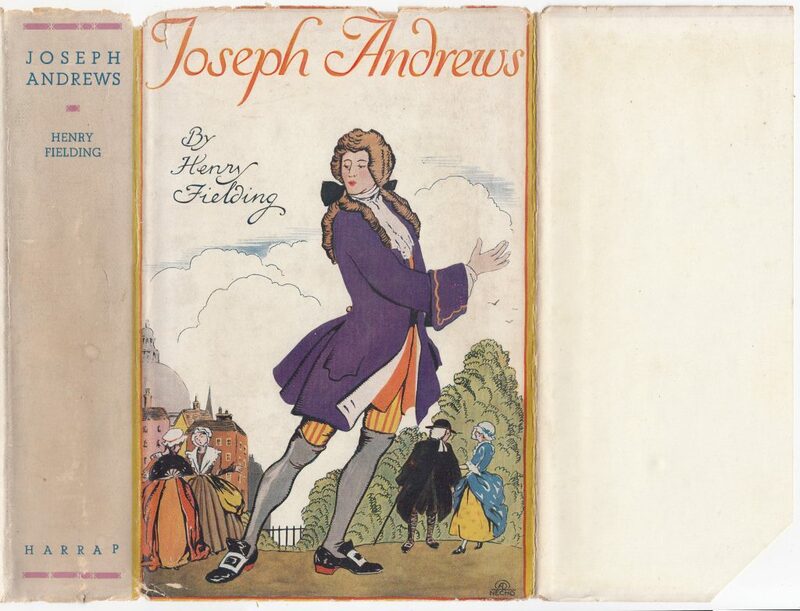 Below are the jackets from Henry Fielding’s Joseph Andrews, from Harrap’s Standard Fiction Library (above), and Dodd Mead’s Astor Library (below). The initial 12 titles, jacket illustration, and the printed book (with the exception of the imprint) are the same in each case. The jackets for Harrap’s Standard Fiction Library are unique to each title. The spine, in two ink colors, and full color illustrated jacket front do not contain the series name. The front jacket flap is blank. The series name and list of 39 titles are included on the back of the jacket. The price (3/- net) is included. The list consists of classic novels, which around series #28 shift to more popular fiction titles. This suggests the series was struggling with the classic titles, which were included in many series of the era. Some of these later series titles show up in Harrap’s Popular Fiction Library in the 1940s and 1950s. 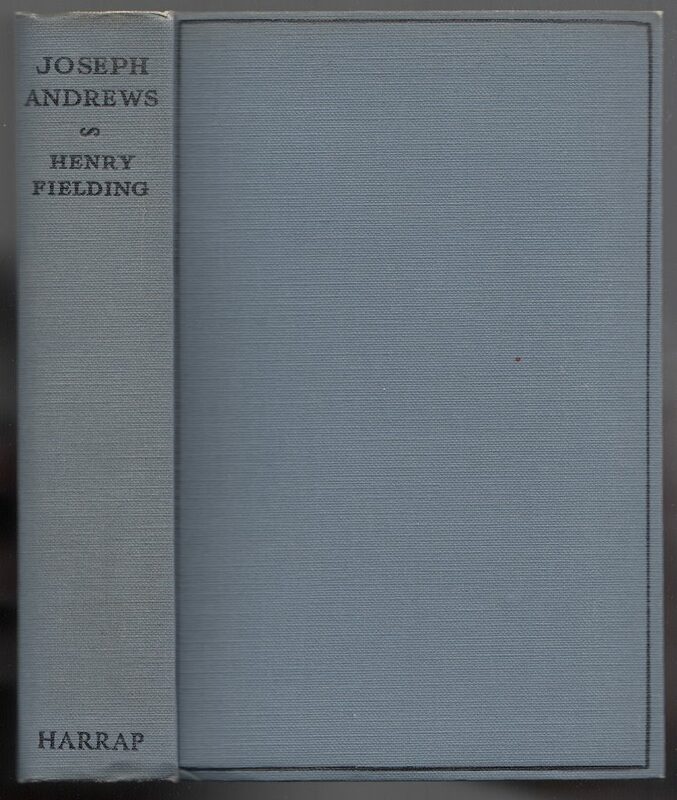 Bindings consist of a minimalist blue-grey cloth binding with black typography and a box imprinted on the front of the book as well as the Harrap imprint. 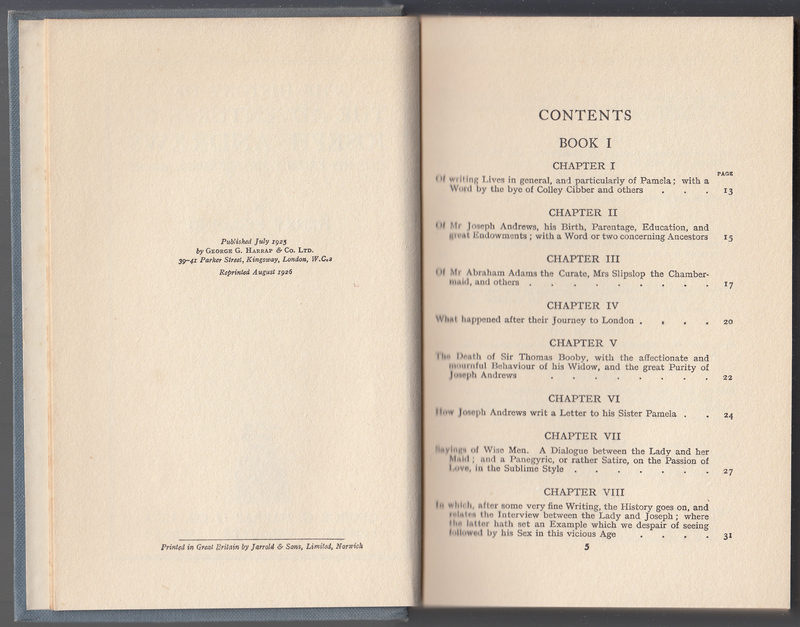 The series name is included on the half-title page. This is not the case with the US editions (the probably not issued Dial Standard Library and the subsequent Astor Library). The title page and publisher’s colophon. Besides the colophon and publisher imprint, the title page is the same as the Astor Library. 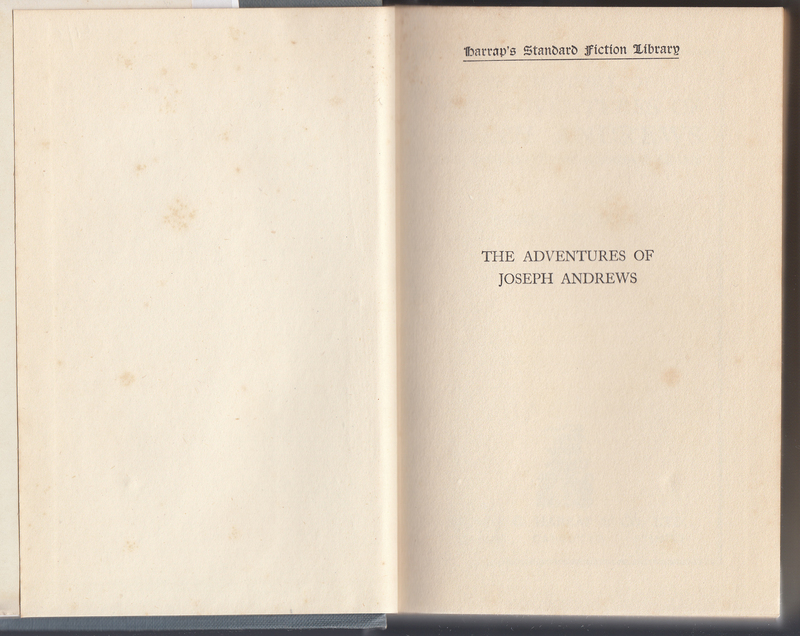 Also unlike the Astor Library, Harrap’s Standard Fiction Library includes publication dates the publisher: this title was first issued in 1925, and this copy reprinted in 1926. 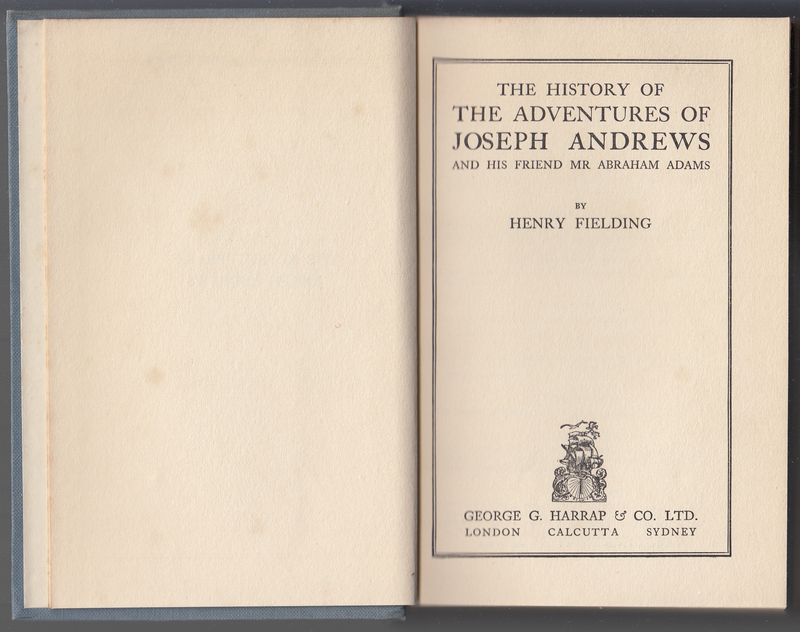 The book was printed by Jarrold & Sons in the UK.